Deuteronomy 31:8 - And the LORD, he [it is] that doth go before thee; he will be with thee, he will not fail thee, neither forsake thee: fear not, neither be dismayed. Matthew 11:28-29 - Come unto me, all [ye] that labour and are heavy laden, and I will give you rest. Psalms 9:9 - The LORD also will be a refuge for the oppressed, a refuge in times of trouble. Philippians 4:7 - And the peace of God, which passeth all understanding, shall keep your hearts and minds through Christ Jesus. Zephaniah 3:17 - The LORD thy God in the midst of thee [is] mighty; he will save, he will rejoice over thee with joy; he will rest in his love, he will joy over thee with singing. Job 14:7-9 - For there is hope of a tree, if it be cut down, that it will sprout again, and that the tender branch thereof will not cease. Isaiah 40:1-5 - Comfort ye, comfort ye my people, saith your God. Job 1:1-22 - There was a man in the land of Uz, whose name [was] Job; and that man was perfect and upright, and one that feared God, and eschewed evil. Psalms 31:1-24 - (To the chief Musician, A Psalm of David.) In thee, O LORD, do I put my trust; let me never be ashamed: deliver me in thy righteousness. 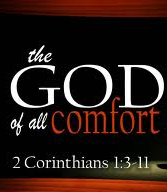 Isaiah 40:1 - Comfort ye, comfort ye my people, saith your God. Isaiah 30:19-22 - For the people shall dwell in Zion at Jerusalem: thou shalt weep no more: he will be very gracious unto thee at the voice of thy cry; when he shall hear it, he will answer thee. Isaiah 30:19-20 - For the people shall dwell in Zion at Jerusalem: thou shalt weep no more: he will be very gracious unto thee at the voice of thy cry; when he shall hear it, he will answer thee. Ephesians 4:28 - Let him that stole steal no more: but rather let him labour, working with [his] hands the thing which is good, that he may have to give to him that needeth. Acts 13:1-3 - Now there were in the church that was at Antioch certain prophets and teachers; as Barnabas, and Simeon that was called Niger, and Lucius of Cyrene, and Manaen, which had been brought up with Herod the tetrarch, and Saul.